Photograph taken by Toya for Stelarc. 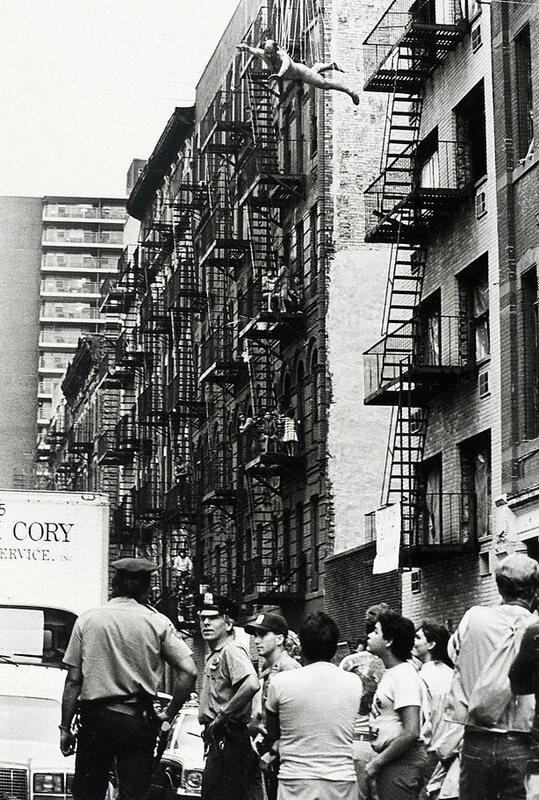 These photographs document the performance piece 'Street suspension', which took place in New York on 21 July 1984. Organised by Mo Gallery, the performance involved suspending the naked body of Australian artist Stelarc by steel hooks connected to a pulley structure on a cable stretched between a building on each side of East 11th Street. Emerging from a fourth floor window, Stelarc was pulled to the centre of the street. Twelve minutes later he was pulled back inside. Born Stelios Arcadiou in Cyprus, Stelarc came to Australia as a child in 1950. His investigation of what he terms the obsolete body began while he was studying painting in Melbourne, when he constructed a helmet that distorted normal vision. Since then he has gone on to use medical body probes, prosthetics, robotics, virtual reality systems and the internet to explore and enhance the biological limitations of the human body. Inspired by Japanese Zen Buddism and reading about the Gutai, a group of artists formed in 1954 whose actions anticipated much of the performance and body art of the 1960s, Stelarc moved to Japan in 1970. In Japan, Stelarc started making films of the inside of his body using medical probes and wiring his body to amplify the sounds of blood flow, heartbeat and muscle movements. Through his interest in yoga and Hindu rituals, he read about the Shaivite Hindu festivals in which devotees suspend themselves with hooks pierced through their flesh as a sacrificial offering to the gods and goddesses, although Stelarcs interest was more from the perspective of less visual clutter than from any idea of spiritual transcendence (or masochism). Between 1976 and 88, Stelarc performed 27 amplified body and suspension pieces in various locations around the world. These were all concerned with the limitations of the human body, a vehicle Stelarc believes is insufficient for humanity to survive in into the future. During this same period he also began to develop ways of enhancing the function of the human body, starting with the Third hand 198194. This mechanical third arm and hand attached to his body was capable of independent movement activated by EMG (electromyography) signals generated by electrodes attached to his abdominal and leg muscles. More recently Stelarc has developed the Prosthetic head 2002, a larger-than-life size projection of his head that can carry on a conversation, complete with facial expressions, and answer questions typed on a computer keyboard.